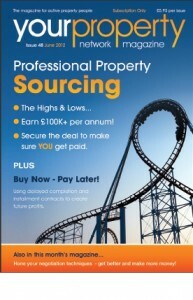 The article is aimed at anyone that’s thinking of sourcing property as a way to make money. The piece features answers to a number of key questions posed by editor Ant Lyons to 3 people that have established successful property sourcing businesses. Each of the 3 contributors have different business models and offer differing services to investors, so the article gives 3 differing perspectives to the questions raised. After free trial has elapsed a subscription costs just £5.95 pcm – the best value property education currently available in the UK! This entry was posted in About us, Property Sourcing and tagged About us, BMV Property, Discount Property, Property Deals, Property Investment, Property Sourcing. Bookmark the permalink.